The Fostoria Learning Center, in partnership with Rhodes State College, will once again offer training for the Manufacturing Skill Standards Council (MSSC) Certified Production Technician (CPT) starting January 22, 2019. Students will participate in training and hands-on labs in four areas: Safety, Manufacturing Process & Production, Quality Practices and Measurement, and Maintenance Awareness. 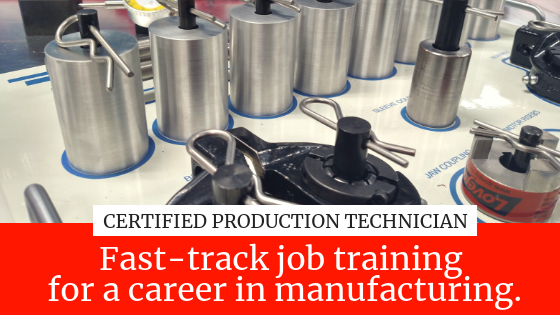 The Certified Production Technician training is an industry credentialed program that allows you to get ahead in the world of manufacturing and is perfect if you’re looking to start a career with a local area manufacturer. Qualified persons may receive funding to cover tuition and book costs from the Ohio Short Term certificate grant. Application for funds is required. Even though the cost of the program is $1,050, grant funds are available to pay $1,000.00 of the fee. The total cost for a student to attend is just $50.00.